The goal of Mykolas Romeris University research journal Social Technologies is to present in research discovered possibilities of social technologies development, to prepare decisions of strategic importance, to foresee trends and tendencies and to offer recommendations for integrated transformation of society. The journal aims to present interdisciplinary publications in informatics, electronics, new technologies, management, psychology, public administration, economics, mathematics and other fields; to encourage scientists seeking for designing social technologies and adapting them to sustainable development of society; to promote interdisciplinary scientific knowledge. Format of publication. 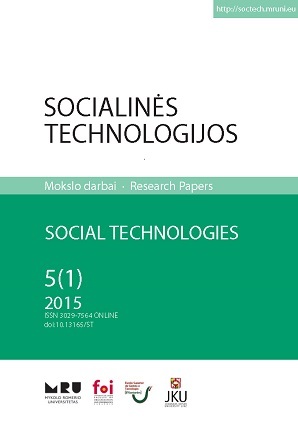 Social technologies cover possible application of technologies in areas of human rights protection, e-justice implementation, personal and community data security, society functionality and communication, networked teaching and education, health systems solutions, leisure activity arrangement and design of social goods and encourage scientific research in the fields mentioned. The researchers are expected to perform systematic analysis of technical, legal, political, economic, psychological or social obstacles preventing more effective adaption of information, communication and new (nano-, bio-, mega-) technologies in social life. Periodicity. Journal is issued semi-annually. Articles are published in English language. Peer review. Submitted articles are reviewed by applying the double-blind method (the identities of the author(s) and reviewers are kept unknown). Each article is appointed at least two referees (scientists with a degree in the relevant field). Indexation. The academic journal Social Technologies is included in the EBSCO Publishing, Inc., DOAJ, C.E.E.O.L., PROQUEST and ULRICH'S international databases.